Organic Music Theory facilitates creative choices from naturally occurring-organic-and self-organized universal elements. The author clearly explains theory drawn from the modal period in jazz then expands it into a range of applications. This work addresses anyone sensing the existence of a larger realm of creative choice. This entry was posted in books on December 13, 2017 by Peter J. Taylor. Ann(ie) Blum in Our Lives, edited by Peter Taylor. What does it mean to have had Ann—Annie to some—Blum in our lives? The letters and stories from family and friends assembled in this book, together with photos and words of Ann’s own, evoke her presence. They allow us to think about what we want to carry forward, into the lives we still have. This entry was posted in books and tagged Blum on September 28, 2016 by Peter J. Taylor. Richard Levins (1930-2016) was an ecologist, evolutionary biologist, biomathematician, philosopher of science, complexity theorist, Marxist, and one-time tropical farmer. Key to all aspects of his thinking was a dialectical logic of process and change. His work provides a framework for the understanding of crises in environment and society and their analytic relationship with capitalism and imperialism, as well as the tools for the critique of biological determinist justifications for the existing structures of power. This collection of essays pays tribute to Levins by carrying forward his work in the development of the understanding of the dialectics of nature and society. This entry was posted in books and tagged Levins on July 30, 2016 by Peter J. Taylor. In this collection, artists and activists and scholars, poets, teachers and artisans–all opponents of capital and empire–reflect on art and history, on education, health and work and welfare, on the city, on nature and the country–in the context of what we call the commons, a term here greatly expanded so as to include not just natural resources such as land, forests, water, and air, but also other forms of common property, including intellectual, cultural, genetic, now all subject to enclosure. The commons, of course, is much contested terrain, the scene of great damage done, (and being done) by the present order of things, to ourselves and our planet, but also of inevitable resistance to the barbarities of modern life as well as to alternatives. Imagine? Can we imagine a better world? There is no roadmap offered here, certainly no line; rather commitments to commons in the here and now, as well as to a future where enclosure and privatization give way to sharing and art and work and life become inseparable, much in the spirit of the artist socialist, William Morris from whom we take our title, River of Fire. This entry was posted in books and tagged Boal on July 30, 2016 by Peter J. Taylor. Why call something genetic variance? This entry was posted in books and tagged book tour, virtual book tour on September 4, 2014 by Peter J. Taylor. Almost every day we hear that some trait “has a strong genetic basis” or “of course it is a combination of genes and environment, but the hereditary component is sizeable.” To say No to Nature-Nurture is to reject this relative weighting of heredity and environment. 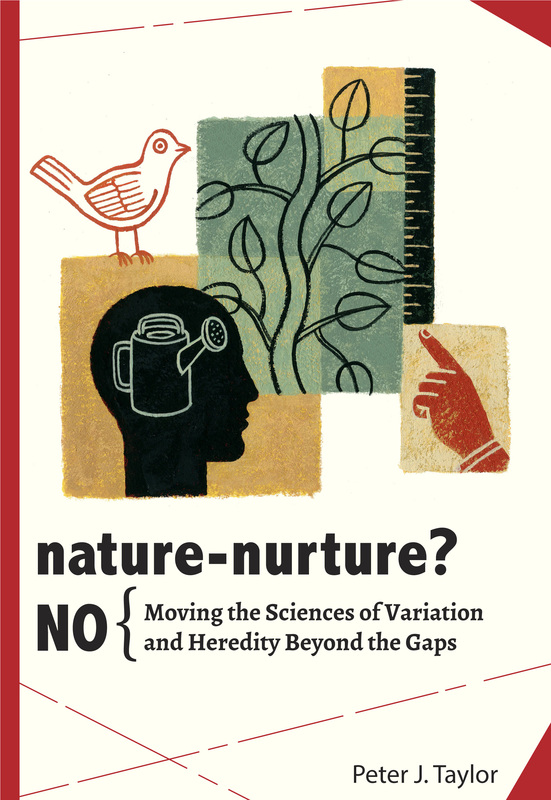 This book shows that partitioning the variation observed for any trait into a heritability fraction and other components provides little clear or useful information about the genetic and environmental influences. A key move this book makes is to distill the issues into eight conceptual and methodological gaps that need attention. Some gaps should be kept open; others should be bridged—or the difficulty of doing so should be conceded. Previous researchers and commentators have either not acknowledged all the gaps, not developed the appropriate responses, or not consistently sustained their responses. Indeed, despite decades of contributions to nature-nurture debates, some fundamental problems in the relevant sciences have been overlooked. When all the gaps are given proper attention, the limitations of human heritability studies become clear. They do not provide a reliable basis for genetic research that seeks to identify the molecular variants associated with trait variation, for assertions that genetic differences in many traits come, over people’s lifetimes, to eclipse environmental differences and that the search for environmental influences and corresponding social policies is unwarranted, or for sociological research that focuses on differences in the experiences of members of the same family. Saying No is saying Yes to interesting scientific and policy questions about heredity and variation. To move beyond the gaps is to make space for fresh inquiries in a range of areas: in various sciences, from genetics and molecular biology to epidemiology and agricultural breeding; in history, philosophy, sociology, and politics of the life and social sciences; and in engagement of the public in discussion of developments in science. Available as paperback through online retailers in North America, UK & Europe, and Australia and as pdf directly from the publishers. This entry was posted in books and tagged genetics, heredity, variation on July 1, 2014 by Peter J. Taylor.